SABANA project was approbed by the European Union’s Horizon 2020 Research and Innovation program, under the topic H2020-BG-2016-2017 Blue Growth: Demonstrating an ocean of opportunities. As Innovation Action, it received funding from the under the Grant Agreement No. 727874 and started on December 1st of 2016. During four years, research and innovation activities will be performed to achieve the final goal: to build and operate a demonstration facility for producing biofertilizers/biopesticides and aquafeed at 5 ha scale. 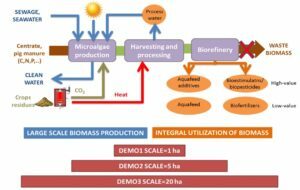 SABANA aims at developing a large-scale integrated microalgae-based biorefinery for the production of biostimulants, biopesticides and feed additives, in addition to biofertilizers and aquafeed, using only marine water and nutrients from wastewaters (sewage, centrate and pig manure). The objective is to achieve a zero-waste process at a demonstration scales up to 5 ha sustainable both environmentally and economically. A Demonstration Centre of this biorefinery will be operated to demonstrate the technology, assess the operating characteristics of the system, evaluate environment impacts and collaborate with potential customers for use. The SABANA project is aimed to develop a new integrated biorefinery concept, not only restricting to the utilization of biomass as raw material, but also considering the whole process from the recovery of nutrients from wastewater (C, N, P) to the final products, as valuable compounds or the whole microalgae biomass, suitable to be applied in agriculture and aquaculture. As example, up to 1 kg of microalgae biomass can be produced per m3 of sewage, up to 10 kg can be produced per m3 of centrate from anaerobic digestion of activated sludge, or up to 100 kg can be produced per m3 of pig manure from livestock. Produced biomass must be adequately harvested ensuring the quality of clean water remaining, in addition to the recovery of the produced biomass (>95%). Produced biomass contains valuable compounds as proteins, carbohydrates and lipids, in addition to specific valuable biomolecules with recognized applications as biostimulants and biopesticides in agriculture, and feed additives in aquaculture, both as extracts/pure chemicals or including in adequately processed whole biomass. The objective of SABANA is to develop the necessary knowledge and technology to complete this process and to demonstrate it at commercial scale, verifying the obtained products. 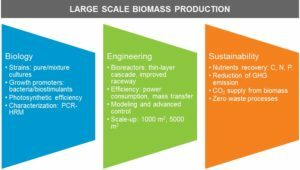 Large scale production: To develop robust and scalable technology for microalgae production (including harvesting and processing), in continuous mode all year round, at minimum cost. Economic analysis must to be used in decision making. Sustainable production: To integrate the treatment of wastes and increase the sustainability of the entire process. Life Cycle Analysis determines what is possible or not..
Markets/commercialization: Only products now requested by markets and legally accepted are considered. Business plan is the driver of the project. This task is focused to the development of technology for robust large scale production of microalgae based on three main pillars: (i) knowledge and enhancement of the biology of the systems, (ii) improvement of engineering of photobioreactors, and (iii) demonstration of sustainability of the entire process. Enhancement of the biology of the system is an innovation activity necessary for the improvement of productivity and robustness of productions systems, whereas improvement of the engineering of the process is a demonstration and piloting activity required for the validation of available knowledge under real conditions. The evaluation of sustainability of the entire process is a demonstration activity necessary to validate and improve the social acceptation of developed processes. This task is focused to the development of suitable technology for the efficient harvesting and processing of the biomass to obtain valuable products, allowing an integral valorisation of the biomass. To be able to exploit the whole microalgae biomass it is necessary to use mild extraction techniques, disregarding extraction techniques that would harm and denature the residual biomass. Conventional extraction and separation techniques, e.g. bead milling, homogenizers, high pressure, heating, osmotic shock and chemicals, are focused on obtaining one product while damaging the other fractions. 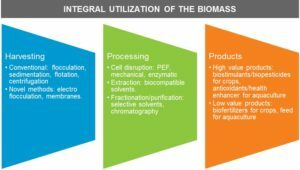 Biorefinery is a facility that integrates biomass conversion and separation, in which the objective is to obtain several fractions by using mild separation. Processing must be performed in wet basis to maintain the sustainability of the process, only final products being dehydrated if requested to ensure their stability. Three major tasks must be performed on this topic: (i) optimization of harvesting method, (ii) development of adequate processing strategies, and (iii) evaluation of target products obtained. The project is led by the University of Almeria but major actors are the companies involved into the project (FCC Aqualia, GEA Westfalia, A.I.A. 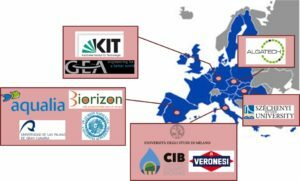 S.p.A., Biorizon Biotech) in addition to high reputation research centers at EU level (Karlsruhe Institute of Technology, Mikrobiologicky Ustav, Universita Degli Studi Di Milano, Univ. Las Palmas de Gran Canaria, Szechenyi Istvan University, Consorzio Italiano Biogas e Gassificazione). In addition to 11 partners from 5 EU countries , Fundacion Cajamar and IFAPA also collaborate in this project. SABANA project is divided into eight work packages closely interconnected. The overall structure is designed to successfully accomplish the objectives planned. WP1 and WP2 are focused to the techno-economic and sustainability analysis of the processes, the two pillars of the decision making during the project. 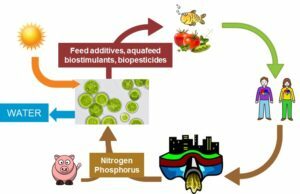 WP3, WP4 and WP5 are focused to the development of technologies for the production of bioactive compounds for agriculture and aquaculture, including the three classical steps: biomass production, harvesting and processing. 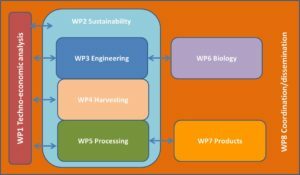 WP6 is focused to the improvement of the biology of the process and the management of the cultures to ensure quality and safety of produced biomass. WP7 is fully focused to the market evaluation of final products in real markets to validate the entire processes. Finally WP8 is focused to coordination and dissemination not only between the partners but also to stakeholders and social. Collaboration with other EU projects, companies, associations, etc. Creation of a Data Center for online availability of real data to associate entities.